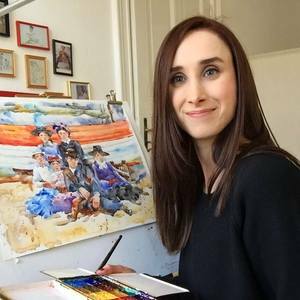 My name is Ewa Ludwiczak and I am a professional artist based in Berlin, Germany. I was born in Nowa Sol, Poland in 1988. Ever since I can remember, I have always loved to draw. During my school years I spent most of my time learning foreign languages and art history. At the age of 19 I moved to Germany and started my studies at a private art school, where I was finally able to concentrate fully on improving my artistic skills. It was there that I learnt the importance of drawing which, in my case, became the key to understanding my subject matter and enabled me to explore different art genres, such as storybook illustration and watercolour painting. I fell in love with watercolour shortly after graduating and have been experimenting with different methods to teach myself this difficult medium. Finally, I've discovered the books by Charles Reid and was fascinated by his philosophy and wonderful, loose style. I couldn't have hoped for a better teacher to guide me through the process of watercolour painting. It's a joy and a privilege to be able to work as a professional artist. I am very excited to be given this opportunity and I am looking forward to continue learning and gathering experience on my way to becoming a better painter.